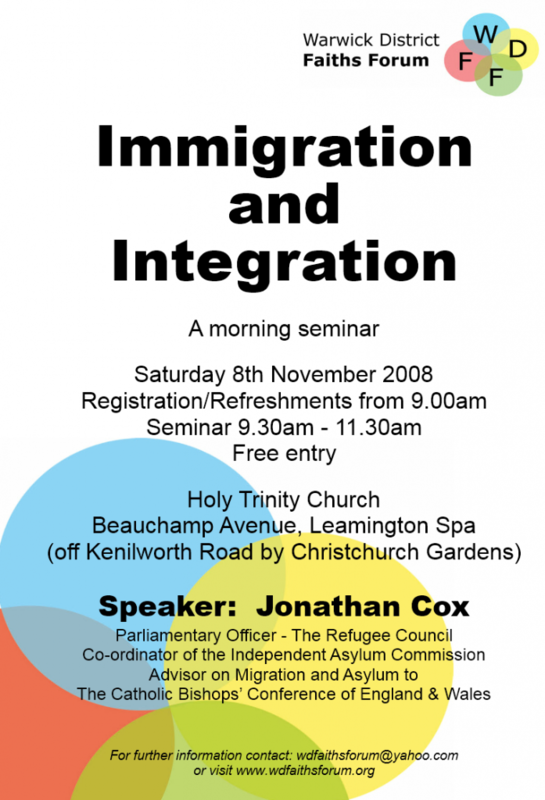 Jonathan Cox is Parliamentary Officer at the Refugee Council, the largest charity in the UK working with people who seek sanctuary in the UK. He has recently completed a secondment co-ordinating the Independent Asylum Commission – the most comprehensive review of the UK’s asylum system ever undertaken. The Commission’s 180 recommendations made national news and are now being considered by the Government. Jonathan has recently been appointed as an adviser on migration and asylum to the Catholic Bishops’ Conference of England and Wales. Saturday 8 November 2008, at Holy Trinity Church, Leamington Spa. In his introduction, Christopher Wilson reminded us of the text “Do justice, love mercy, and walk humbly with your God”. The important thing to remember is that these are people with their own stories to tell, not just numbers and statistics. We too easily forget that some of the great British institutions, like Marks & Spencer, and fish and chips were brought into being by immigrants. Acknowledgement of different pasts; respect for current diversity; commitment to a shared future. Who comes to the UK? How many come and how many from each category? Most people fail to recognise the difference between the different groups and which are the largest. Total of 109 million people arrived at UK ports and airports in 2007, of which the majority are tourists, business travellers and students. People coming to the UK to work: EU freedom of movement: 200,000 A8 migrants in 2007; work permits and now the points based system for non-EU workers: 124,000 in 2007, of whom 53% from Asian; 28% from the Americas; 8% from Africa; 6% from Europe; 5% from Asia. Family reunion: spouses of British citizens; close relatives of refugees. Population context: 60 million people live in the UK, of whom 8% are non-white British. Varying rates of illegal immigration – trafficking, people smuggling etc. Polish with a teaching degree; came to the UK when she was 23 in 2004 for experience and career; worked as a live-in au pair in London for a year; saved for a deposit; got a job in market research – steadily working the way up the career ladder; now has a flat and lots of British and Polish friends; is here for the long term; based in London. Slovakian with secondary education and experience as a handyman; came to the UK in 2006 as an EU national to send money back home; lives in a house with six other Slovaks; has a job as a handyman for a landlord; sends money back to his family in Slovakia and plans to go home and start his own business; is not eligible for benefits and work is less forthcoming; exchange rate means working here is not worth so much; came to London but has moved to Wales to find work. Integration: How do we get to this point? Yet deeply ambivalent – applaud the contribution of the last set of migrants/refugees who have integrated while keeping out the current set of refugees. Language barriers; motivation for migration; trauma of those seeking sanctuary; divided communities and racism; public attitude: ignorance leading to speculation. What can citizens, faith communities, local government and others do to aid integration? Imagine modern Britain without chicken tikka massala, Marks & Spencers, the Muppets and the Mini – all these were brought to the UK or invented by migrants. And even the archetype of British cuisine, fish and chips, was brought here by a Jewish refugee in the 17th century. It is no exaggeration to say that people who have come to the UK to work or in search of sanctuary have helped shape our nation. Yet if we are complacent or don’t get integration right, we threaten community cohesion, throw away the legacy of past migrants and miss out on the contribution that future generations of migrants will bring to our country. The challenge of integration is not an easy one. But if we can play a part in helping migrant and settled communities to acknowledge their past differences, to respect each other’s diversity, and to commit to a shared future together… Well, then the outlook need not be one of division and distrust in our communities – but instead a vista of harmony and hope. Jonathan pointed out in response that we all need to ask ourselves the TV question “Who do you think you are?” as this is challenging and revealing for all of us, not just TV personalities. Jonathan also reminded us about the very many displaced persons within their own territories (Sierra Leone was an example many of us in the audience were familiar with). And also those countries receiving many thousands seeking sanctuary closer to home, eg Tanzania has sheltered approx 400,000 refugees from Burundi and Democratic Republic of Congo in a two-year period in recent years. The EU is seeking harmonisation of asylum policy, but there are difficulties as each nation state provides different degrees of support and help and has different ways of tackling the legality of people seeking refugee status: eg the difference between Greece and the UK. On the question of young children: Jonathan says statistics are available, and mentioned children still in their teens arriving without family support: where families can get their children out (as the Jewish people in Germany did on the Kinder Transport) they will do that. In UK they are given discretionary leave and then have to go through the asylum process when they are adults. The Refugee Council gives as much support as possible as otherwise these young people risk being very isolated and vulnerable. On the question of how UK deals with people seeking sanctuary and integration vis a vis other EU countries, there are lots of differences across Europe. For example Jonathan quoted the difficulties experienced in France where the wearing of identifiable clothing is banned. On the fraught question of illegal entrants, Jonathan pointed out that there is a real difficulty in integrating these people, even if they are working and have a National Insurance number. Yet the UK government cannot possibly afford to repatriate all, even if they could identify them. Sadly this is a political football. At the moment the Conservative Party is deliberately not exploiting public concerns about asylum. Councillor Mota Singh thanked Jonathan for a very eye opening and practical talk on some of the key the issues of Immigration and Integration and also thanked everyone for taking the time to attend the seminar.